In this blogpost I am explaining how to use your own certificates for your Azure Stack installation. This can be either certificates provided by your own enterprise CA or even a public trusted multi-wildcard certificate. A later blog post will describe how to get Azure Stack Development toolkit installed on either your enterprise network or directly on the internet with a custom domain name. The directory C:\CloudDeployment\Setup\Certificates contains 2 folders that are named AAD and ADFS. Depending on the scenario (AAD vs ADFS) a PFX certificate that contains the certificate chain needs to reside in each subfolder. 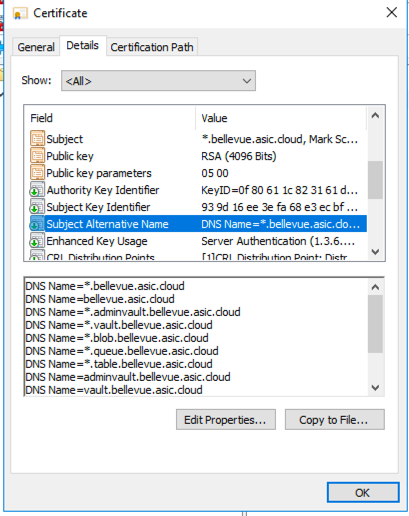 For an Azure Active Directory installation, all PFX certificates are placed in the folders below the AAD subfolder. For ADFS installations they can be placed in the ADFS subfolders. Make sure the password for PFX is the same as the local Administrator password. This means that the default Azure Stack installation files are used without changing anything else. The advantage is that within your enterprise or organisation you can request certificates that are trusted by clients who connect to their Azure Stack environment via VPN or using the script Ruud has made available on TechNet. The next blogpost will describe how to install Azure Stack in your own enterprise network or connect it directly up to the internet.